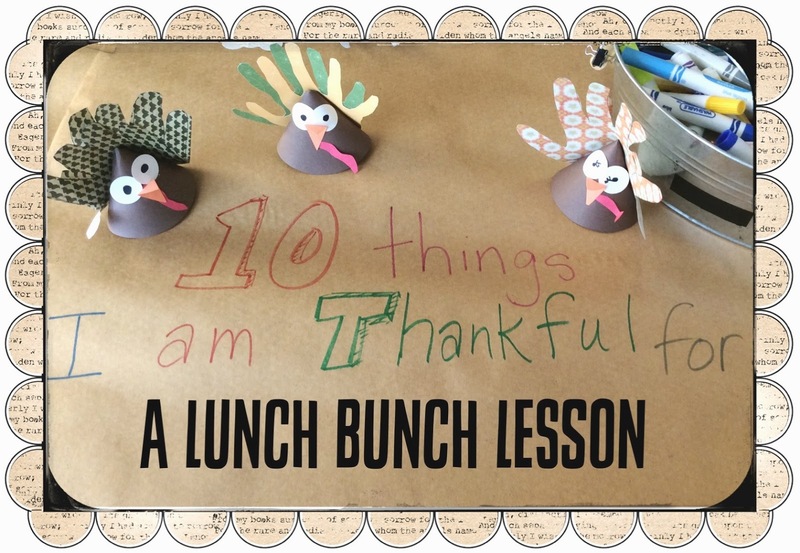 Since it is the week before Thanksgiving, I thought we would focus this week's lesson on things we are thankful for. As the kids entered my room with their lunches, I asked: What are you doing for Thanksgiving? When we were finished, we talked about another thing we should say more often is what we are thankful for. I had pre-cut materials before they arrived to make turkeys. I had them trace their (or their neighbor's hand) from scrapbooking paper and then cut out. On each finger I had them write one thing they were thankful for. Family and friends topped the list, but spaghetti, video games, and minecraft were also popular choices. After their fingers, or feathers, were finished, we stapled them on to their turkey body and added a face. We had just enough time in our 30 minute lunch period to do this ( and that included standing in the lunch line, eating, and bringing their trays back). Below are some pictures of the supplies needed and what I cut ahead of time. 1/2 circles for the body. I just traced a paint can. I did this with the 5th and 6th grade boys. I was a little worried if they would like it or not, but they were really into it. Next week I'll have the girls come in on Monday and Tuesday to make one too.